Song Joong Ki, one of the most famous and most popular actor in Korea (thanks to his role as Yoo Si Jin in the hit drama, Descendants of the Sun) is originally a cast member of the top variety show, Running Man. The show features games, missions, and challenges with teams competing with each other. From the very first episode up to episode 41, Joong Ki is known in the show as the 'Enthusiastic Youth', 'Active Joong Ki' and 'Brainy Joong Ki'. To reminisce his best scenes in the show, here's the top 10 moments you'd love to watch again. Joong Ki is not only known for his nickname 'Brainy Joong Ki'. He's also athletic and competitive. In one of the earliest episodes of Running Man, he showed off his sporty side by successfully executing the human rocket challenge. Of course, he's got the support of Sparta Kook by being the forced action, but Joong Ki's opposite reaction was made in a handsome manner (even Jae Suk questioned why does he have to be so handsome in the water). His teammates was so amazed, they even exclaimed 'wonderful!'. 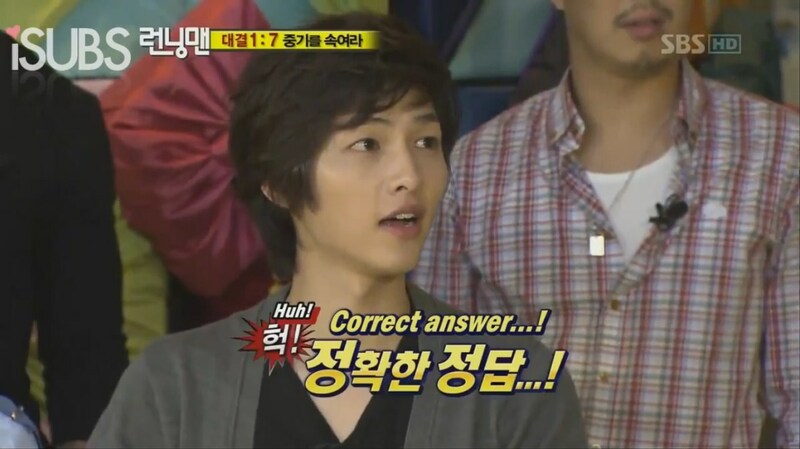 In this episode, the other Running Man members were asked to trick Joong Ki in a speed quiz. It was also revealed that before he became an actor, he appeared as a contestant on KBS Quiz Korea and he won second place. Since his image is being smart (as per the PD's instruction) their mission is to beat him in the question and answer challenge. All of them should get one correct answer, except Joong Ki, to get the running ball. The seven members, worrying that they might not beat his intellect, reviewed the questions beforehand. 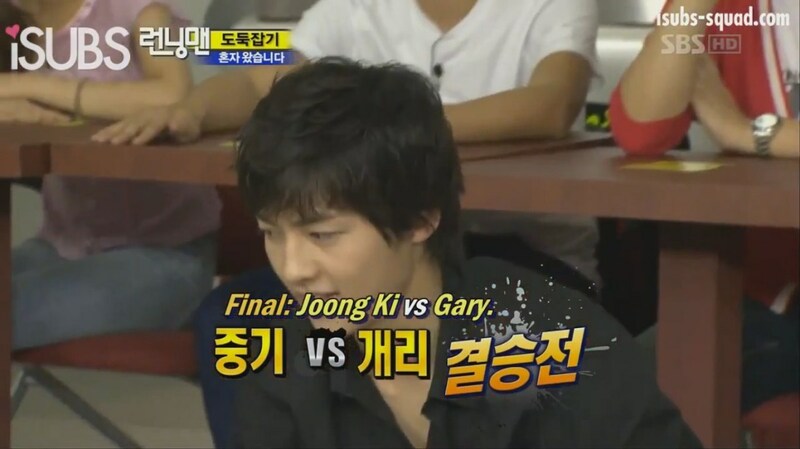 However, Joong Ki became a huge threat to the Running Man's mission because he almost got four correct answers! Although he is smart, Joong Ki is always the first one to be eliminated during the name tag ripping game. 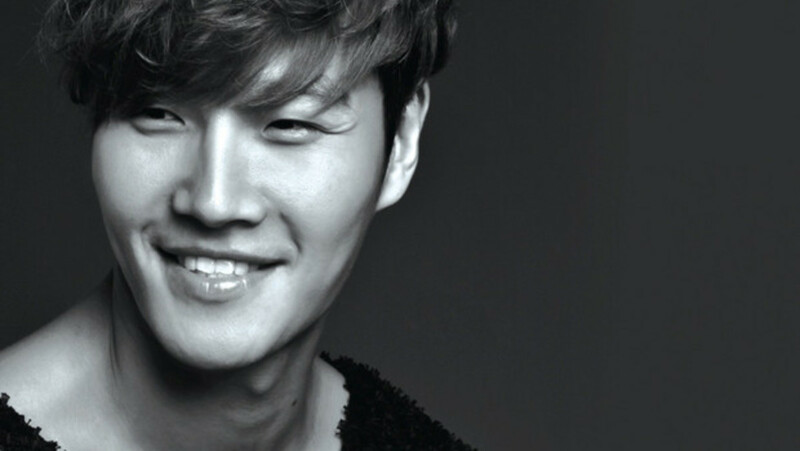 But in this episode, he miraculously saved the Mission Team by completing the task before Sparta Kook caught him. Their mission is to find the school bells and ring it, but as the strong Chasing Team gathers (Sparta Kook, Ace Ji Hyo, Haroro, Gary, and the guest, Go Joo-won) almost all of the Mission Team were eliminated. When Yong Hwa was caught, only Joong Ki was the remaining member, and he still have one bell to find. Good thing, he found the bell just in time, because Sparta Kook was almost there to catch him. For the first time, he became the MVP of the day! It's just comical how you will be reminded of Draco Malfoy from Harry Potter in this episode. In this office-themed challenge, they are asked to play basketball while sitting in their office chairs. 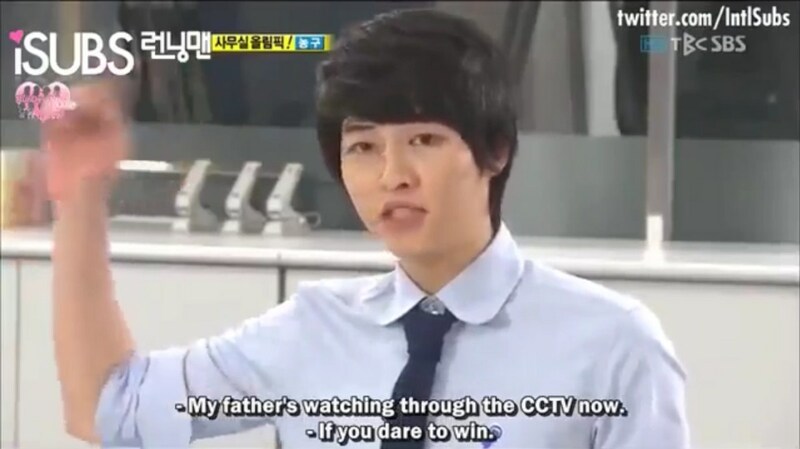 Because of the game, Joong Ki bursts out, claiming that he is the Chairman's son, and he threatened the opposite team as he bravely tells that he will tell his father about this (which is just so similar to Draco's punch line: My father will hear about this!) Indeed, he was like a spoiled son in this episode. But what's funnier is what happened next - after he arrogantly threatens him, Gary pulled back his chair and he fell off it! In this 'find the thief' mission, Joong Ki had almost win the challenges to escape the card game, but it seems like he's out of good energy to win it. First, he faced Gwang Soo in the 3-6-9 Bibo-Bibo game, and they already reached a high number when suddenly, he made a mistake with the counting. 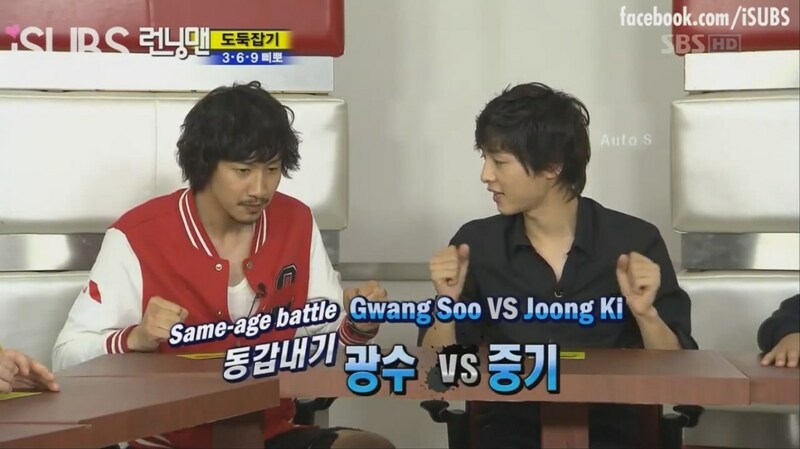 Thus, Gwang Soo wins and Joong Ki remained in the game. In the second chance, he is also the qualifier for the final round. He faced against Gary in the 'I Came Alone' game, where one member calls numbers and the corresponding number of numbers must stand up. But then again, he lost to Gary and he lost the chance to escape the card game. During this episode, Running Man members were asked to take a photo of an animal that suits each other. Later on, they were asked to complete their profiles, by giving out their animal's nicknames, age, weight, height, ambition, and specialty. Because of the recent episode's dancing challenge, Joong Ki became confident enough to write 'dance' as his specialty, and proudly presented the dance move he learned from TVXQ (and it looks funny). Jae Suk had also noticed his quick wit during that day, as he teases Ji Hyo's cursing abilities as his specialty, and that her ambition is to be a cursing grandmother. 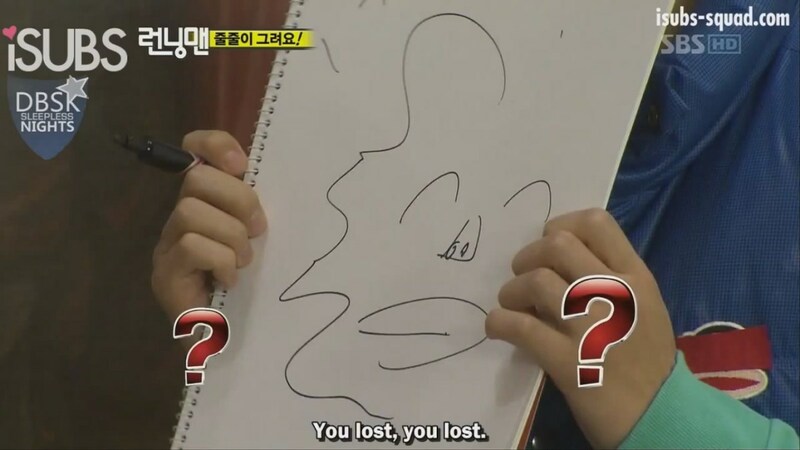 The truth about Joong Ki's drawing abilities have been confirmed during these 'chain drawing' missions in Running Man. 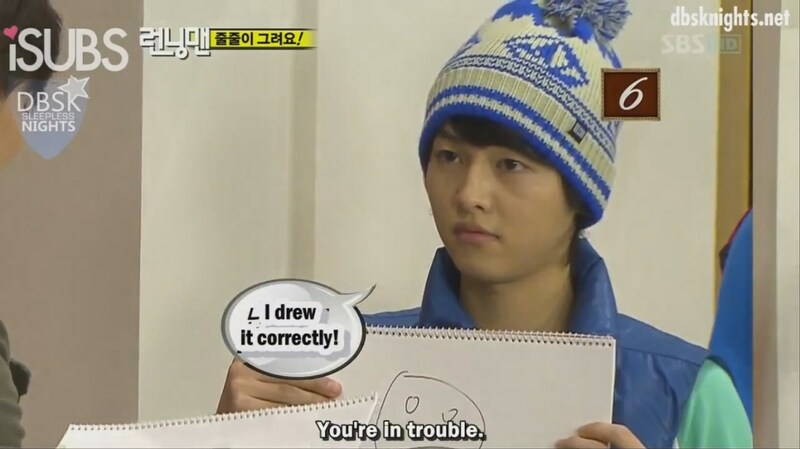 The enthusiastic Joong Ki claimed that he took art classes especially for Running Man's drawing challenge. However, it turns out that his art classes is that only of a beginner's level, because even his teammates cannot comprehend his abstract artwork. 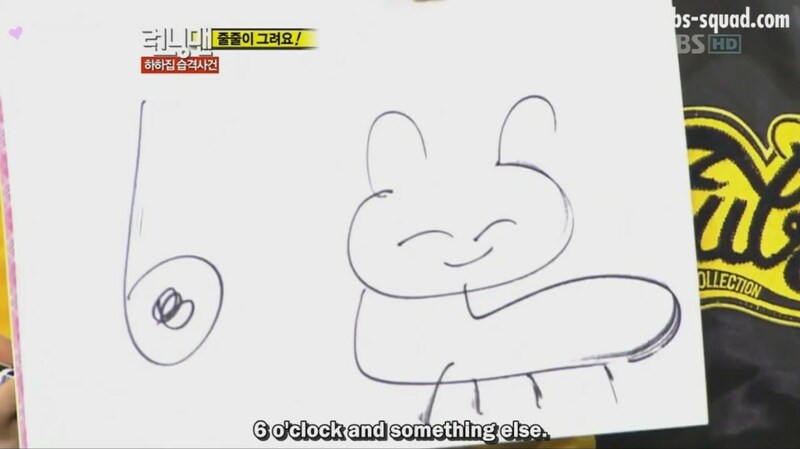 His funny drawings of toilet (which he believed is a robot) and kangaroo is just memorable. 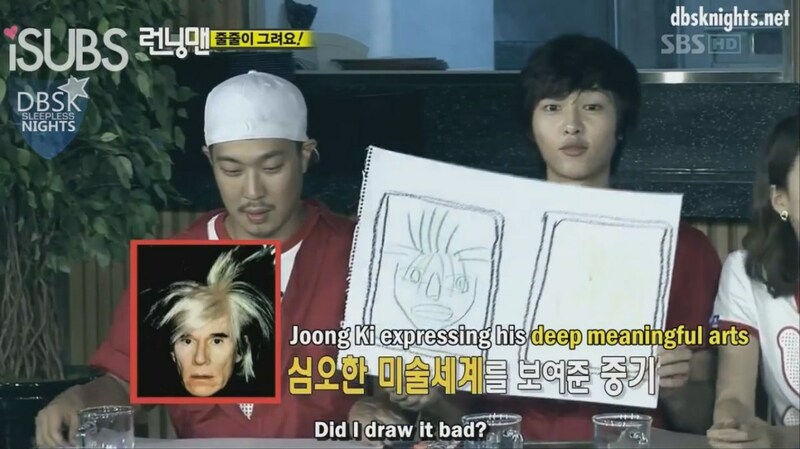 The art problems with Joong Ki started in episode 12, when he passionately draw one of Andy Warhol's painting (which is funny because he's clueless on how bad the drawing is). 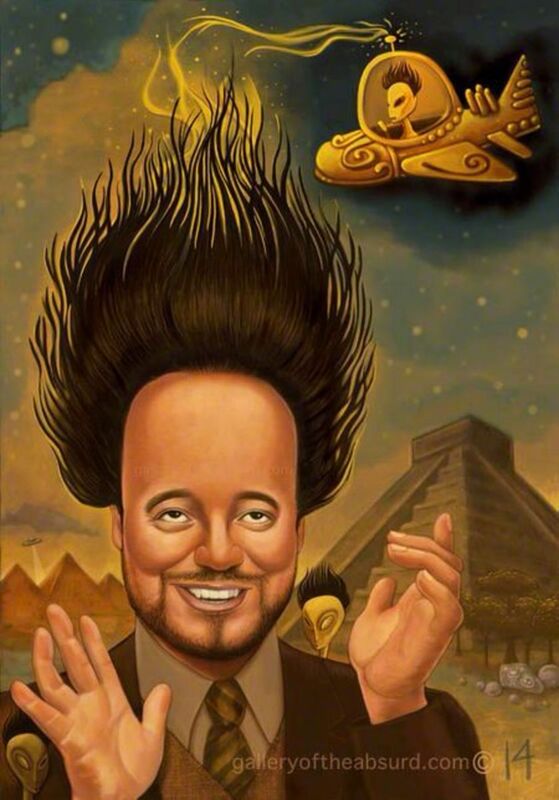 Also, on episode 41, he once again showed his creativity in art by relaying the drawing that turned into something else. His innocent face and pride in taking art classes is simply funny! Another weakness of our Active Joong Ki is dancing, where he is being teased for his stiff dance moves. Watching and seeing his determined face while doing a wave will definitely make you laugh! You won't even imagine that the pretty boy has some weakness when it comes to dancing. Even so, he remained confident about his dancing skills, and the Running Man members cheered him on as he do his very best to dance. Fighting! The origin of Song-Song couple started in episode 15, when all the male Running Man members, including the guests Kim Kwang Kyu and Tony Ahn, was given a mission to increase Ji Hyo's heartbeat. Because Ji Hyo was always wearing her blank expression, the goal of the mission is to make her fall in love. Different techniques and strategies were made by the members. Gwang Soo and Haha were so funny, as well as Jae Suk and Suk Jin's retro style. 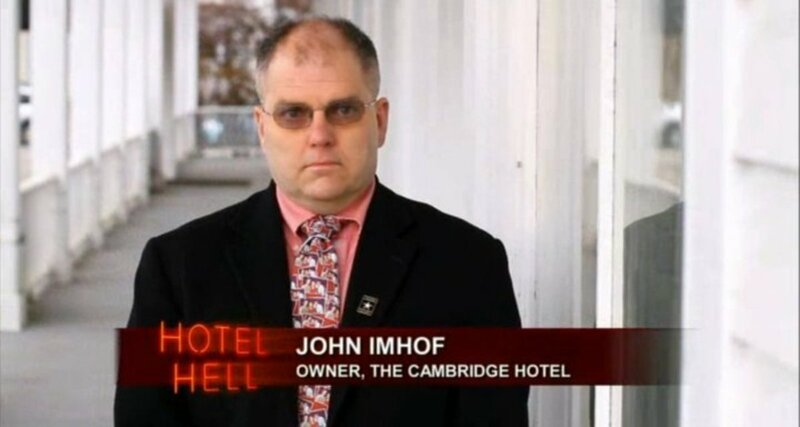 But there's one candidate that definitely created the romantic atmosphere. Joong Ki, being an actor with a pretty face, did his very best to win Ji Hyo's heart by kissing her suddenly on her cheeks! At first, it was a shy encounter until Joong Ki seemed to gain his strength in confessing to Ji Hyo. Even though it's just a mission, (and Joong Ki thinks of it as for the sake of winning the Running Ball) fans of RM started to think that they look good together. This cheesy train scene was the beginning of Song-Song couple, while the Monday Boyfriend, Gary, acted funny as he showed his jealousy towards Joong Ki. The story of Song-Song couple doesn't end in episode 15. 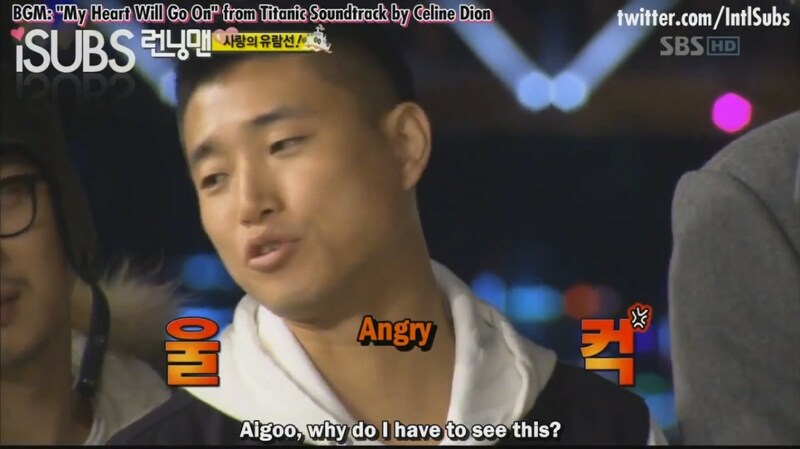 Our Pretty Boy's romantic attack with Ji Hyo continues in the Cruise Special Episode of Running Man. The challenge, which is to find a date, created the chance for Joong Ki and Ji Hyo to re-enact the famous scene from Leonardo DiCaprio and Kate Winslet's blockbuster film, Titanic. Seeing the two in their romantic scene in the deck makes the other Running Man members go squeal (even Lizzy can't hold it in). It seems so real, and the scene is just perfectly romantic! However, this is just a variety show, and whatever was done is just for the mission (which is to get the running ball). To end this romantic scene, Jae Suk called for a stop, and the Monday Boyfriend, Gary, created a funny atmosphere by being angry. Also, it wasn't Joong Ki who won the running ball, because Ji Hyo chose Gary in the end (it was Monday after all, therefore it's going to be the Monday Couple)! Did we miss your favorite Song Joong Ki moment in Running Man? Recommend them by leaving a comment below!